I must say this is the first time I have posted a work of Zurab Tsereteli in this space. I’m not a fan. 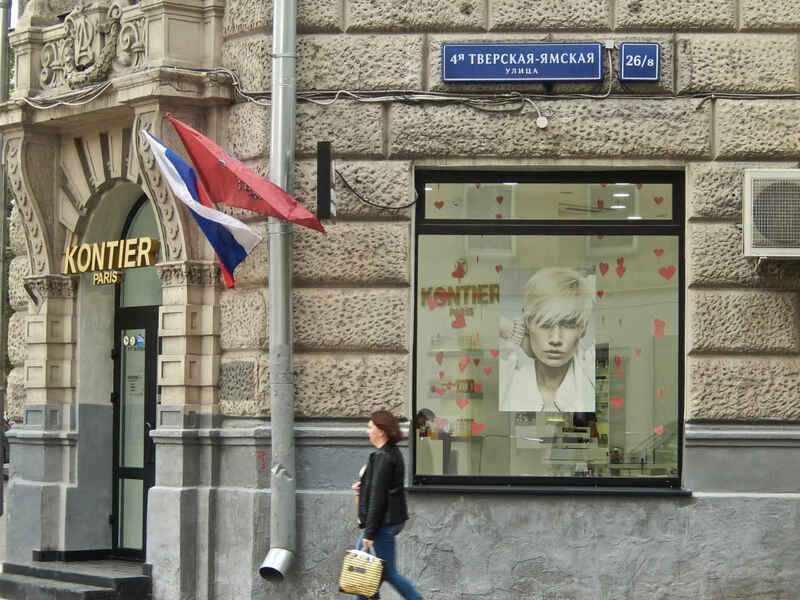 Everybody in Moscow knows him for several reasons, few of which work in his favor. 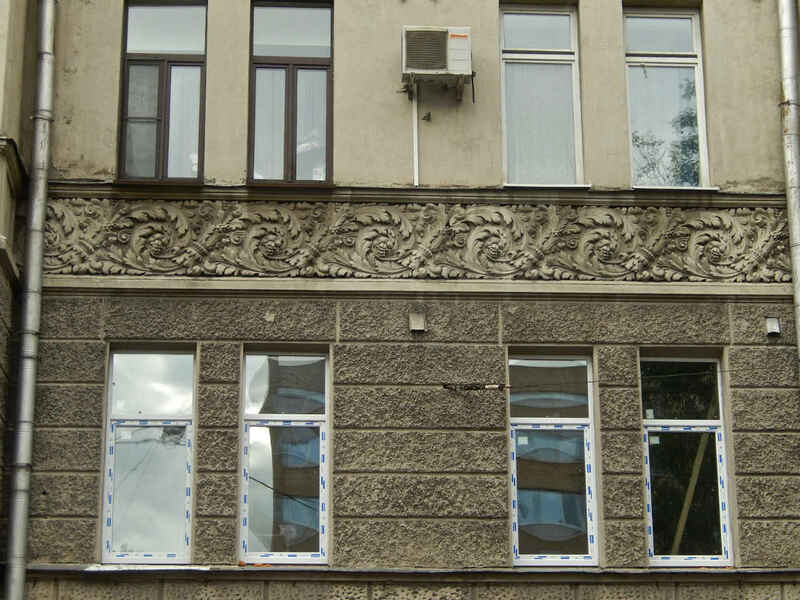 He has long been the main art consultant for Moscow, overseeing the erection of numerous tasteless monuments created by himself and his cronies. He created the monstrous (in all senses of the word) sculpture of Peter the Great that looms uglily (you think that’s not a word? 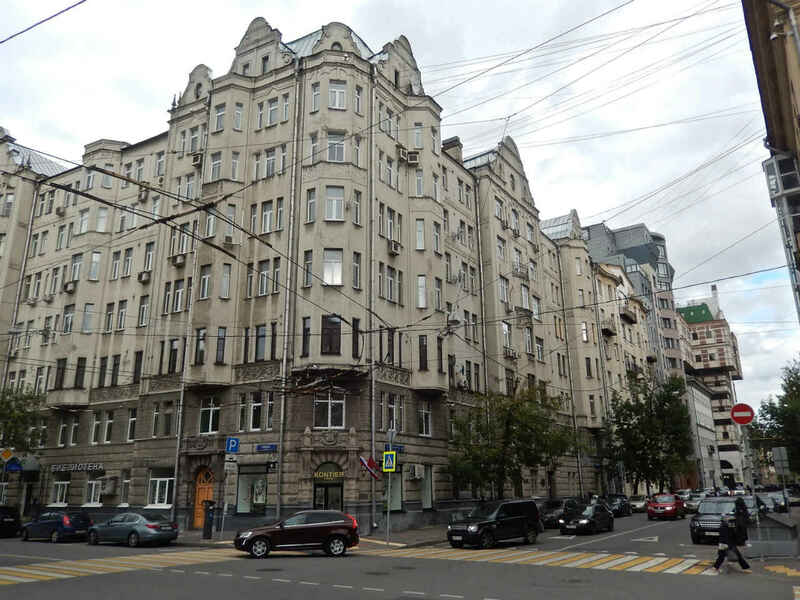 go see what I’m talking about…) over the Moscow River and the New Tretyakov Gallery. 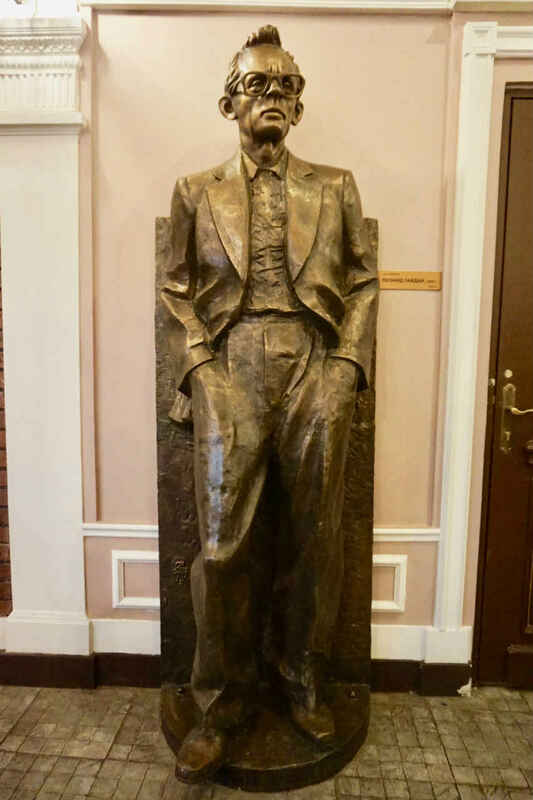 The legend on that is that Tsereteli wanted to give the statue to St. Petersburg and they refused it. Several sources even tell us that he planned on making it a statue of Christopher Columbus and giving it to the U.S., but the Americans – that time at least – couldn’t be duped. Enough of that, however, my real topic today is film director Leonid Gaidai. Leonid Gaidai (1923-1993) had one of the great runs of success in Soviet film. From 1965 to 1973 he unveiled five consecutive hit comedies that were not just hit comedies. They were films that mythologized the comic characters of Soviet history for all times. They are films that everyone knows and loves even today because they all run frequently on Russian television. Their scripts are adapted for theater and played on stage. Their characters are beloved figures – the actors who played them are national heroes. The words they spoke are often quoted, the predicaments they got into are familiar and referred to often. The string began with Operation Y and Other Adventures of Shurik (1965). It continued with The Prisoner Girl of the Caucasus, or, The New Adventures of Shurik (1966), The Diamond Arm (1968), The Twelve Chairs (1971), and Ivan Vasilyevich Changes his Profession (1973). The Twelve Chairs was based on the popular comic novel by Ilf and Petrov, while Ivan Vasilyevich was based on Mikhail Bulgakov’s play Ivan Vasilyevich. Gaidai was always a member of the team that wrote the screenplays. Gaidai had a special love and appreciation of actors. He was a star-maker, and he was quite loyal to the actors who enjoyed success with him. His Russian Wikipedia article has an entire section devoted to actors and the lists there are quite impressive. Numerous actors worked with him on eight, nine or 10 films. Many of them, huge stars, owe their popularity specifically to their work with Gaidai. The actor who played Shurik, Alexander Demyanenko (1937-1999) worked in an enormous number of films, at least 110, but throughout his career he was known to the public as “Shurik.” So important was “Shurik” to Gaidai, and Gadai to Shurik, and so popular was the figure of “Shurik,” Tsereteli gave his sculpture of Gaidai some of the same features as his beloved character. So, when you look over these images of Gaidai, you also see more than a little of Shurik. It was a rare clever stroke for Tsereteli, who is better at being obvious with overkill than subtle with humor. Gaidai was born in a small town in the Far East, moving with his family later to Irkutsk. During the war Moscow’s Satire Theater was evacuated to Irkutsk where it continued performing new and old shows until the war ended. 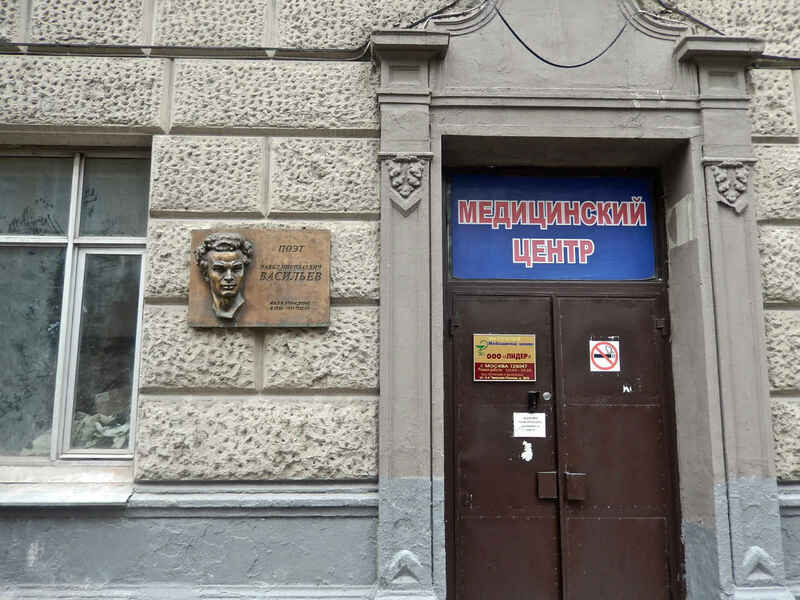 The young Gaidai worked as a stagehand for awhile at the Irkutsk Drama Theater, apparently handling many of the Satire Theater shows. Perhaps it’s a little romantic to think so, but one wants to think that the exposure to Moscow’s best satire (this was one of the capital’s most popular theaters at that time) had an effect on the young future film director. 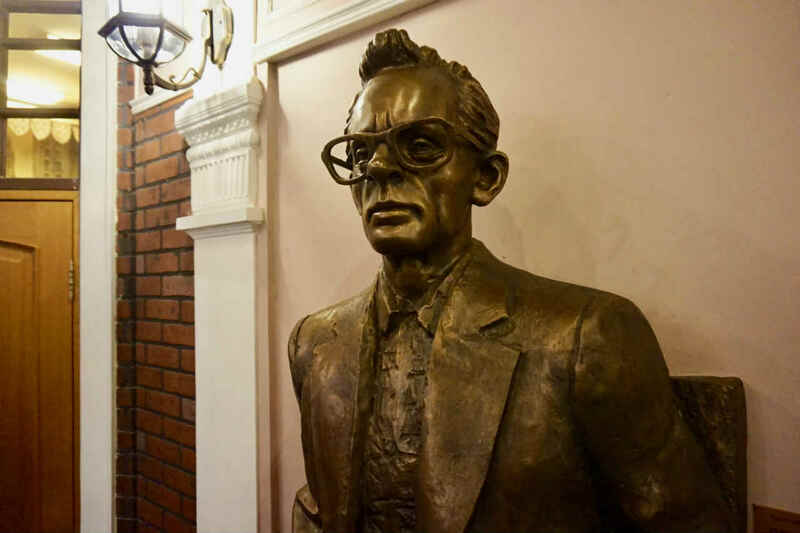 After the war, during which he was seriously injured, stepping on a mine, he attended and graduated from the Irkutsk Theater Institute in 1947. He studied film directing at the State Film Institute in Moscow from 1949 to 1955. That year he was hired as a staff director at Mosfilm. His first film, The Long Journey, co-directed with Valentin Nevzorov, was released in 1956. It was based on a story by Vladimir Korolenko and told the tragic tale of young love in Siberia. His second film, The Groom from the Other World (1958), was a satire of Soviet bureaucracy and caused the director enormous troubles. The authorities found this film so offensive that they cut half of it out before allowing it to be released. In the process, the film was downgraded from a feature film comedy to a short. In an effort to help the young Gaidai rehabilitate himself in the eyes of the authorities, Mosfilm’s general director Ivan Pyryev essentially forced Gaidai to take on a patriotic topic for his third film, Thrice Resurrected. Although it was scripted by the highly regarded playwright and songwriter Alexander Galich, Gaidai never warmed to this work. A few more years of floundering found him making a couple more short films until he hit his stride with Operation Y and Other Adventures of Shurik. Over his career Gaidai made 15 features and three shorts. 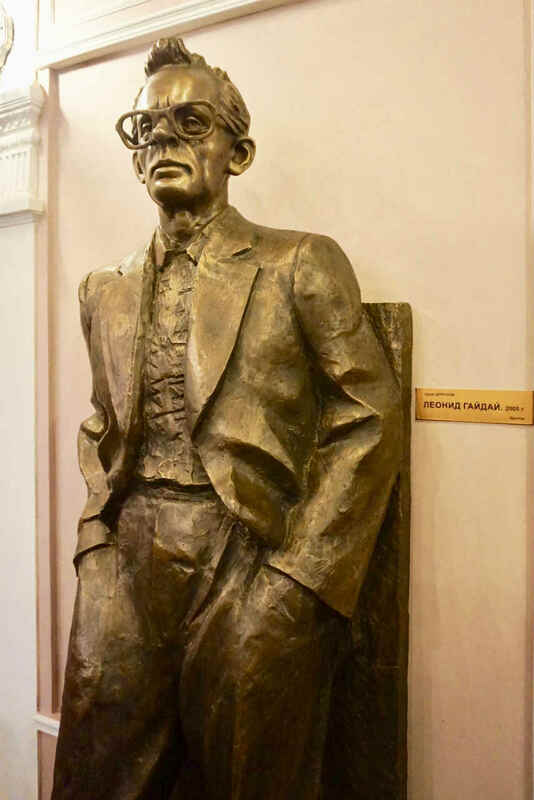 The statue that you see here is one of three made by Tsereteli for the foyer in Eldar Ryazanov’s Eldar Film Club, located at 105 Leninsky Prospect. The other two are of Ryazanov and still another great Soviet film director Georgy Danelia. More about them another time. It seems to be a time of discovering poets for me. A few days ago it was Richard Ter-Pogosian. Now it is another. 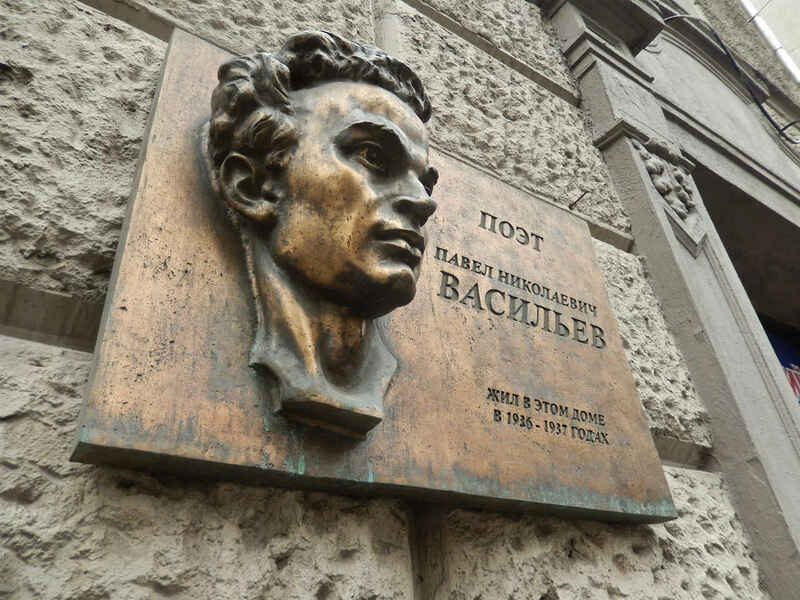 I was walking through my former city of Moscow yesterday and happened upon a plaque I didn’t know commemorating a poet I’d never heard of – Pavel Vasilyev, who lived in this building at 26 Fourth Tverskaya-Yamskaya Street in 1936 and 1937. Yes, you probably guessed right: that latter date is also the poet’s year of death. The meat grinder year. The year of blood. The year of hatred, lies, villainy and infamy. What will ever be done to wash away the sins of that year? Nothing? Can nothing wash those sins away? And what happens if that is true? That is no rote, routine recommendation. Pasternak here, in just a few lines, places Vasilyev among (and to some extent, above) the greatest poets of his time. 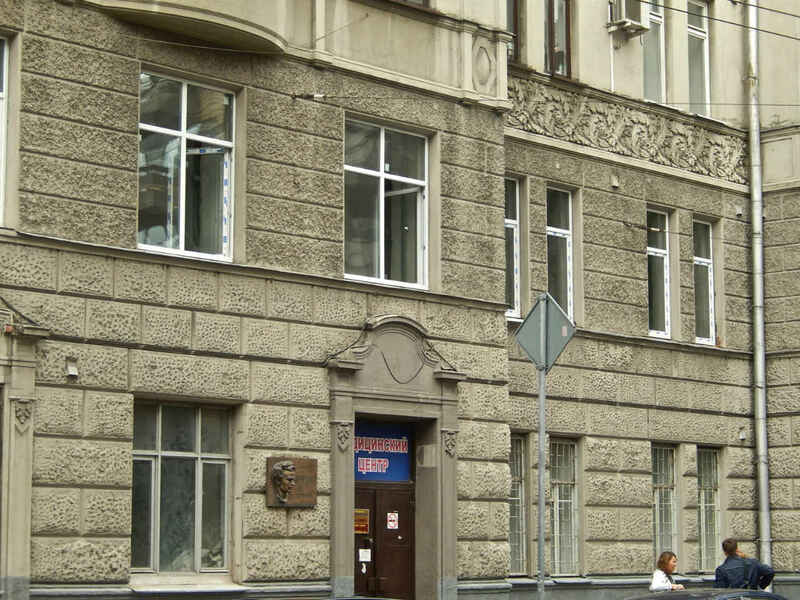 Vasilyev was first arrested in 1932, although was released before long. Gorky jumped on his back in 1934 and, surely consequently, Vasilyev was kicked out of the brand-new Writers Union in January 1935. Six months later he was arrested again, this time for engaging in what, by all accounts, was a nasty, drunken, public fight with a poet known as Jack (Yakov) Altauzen. Judging by the record, Vasilyev’s antisemitic views were well known, and this brawl appears to have been a flare-up of racist behavior. Vasilyev was released early again, in 1936. In February 1937 he was arrested still again for the supposed crime of belonging to a terrorist group whose purpose was to assassinate Joseph Stalin. 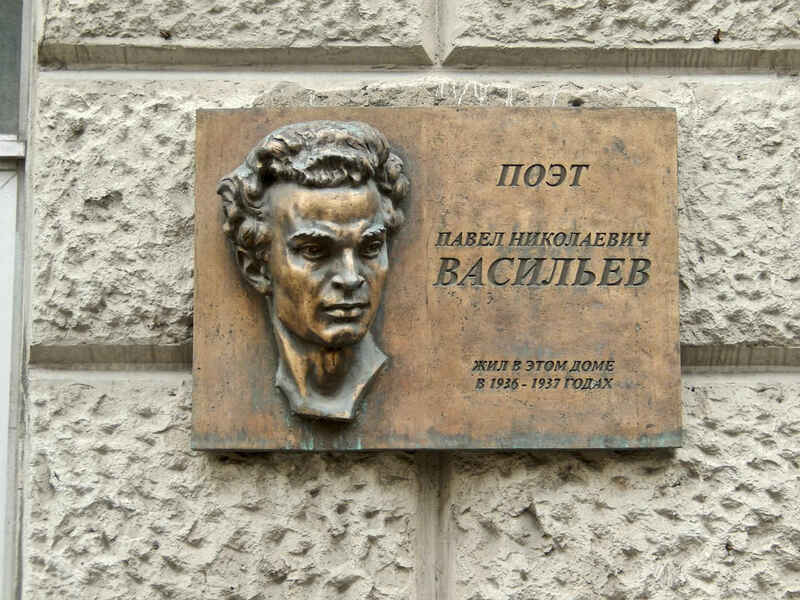 He was condemned to be shot and the sentence was carried out July 16, 1937, in the Lefortovo prison. 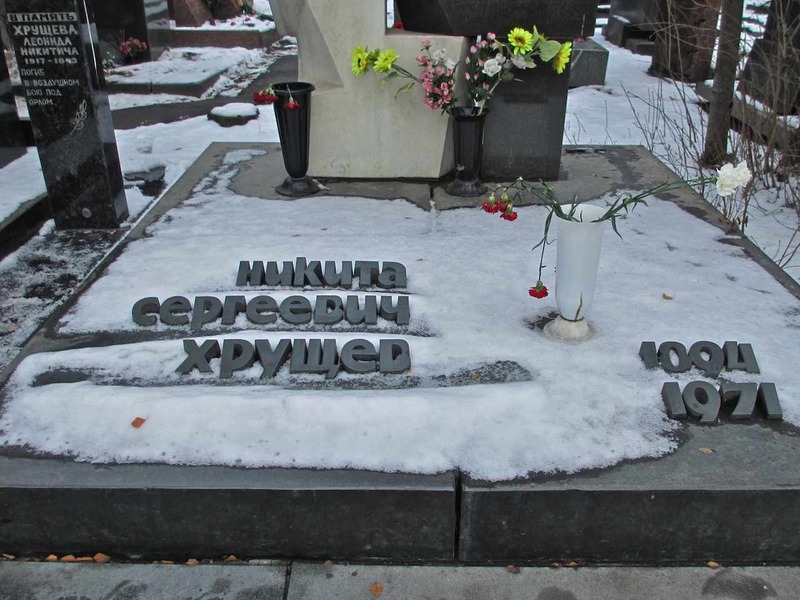 Similar to his contemporary, Vsevolod Meyerhold, his remains lie in an unmarked grave in the Donskoi Monastery. I don’t know enough about Vasilyev to take sides for or against him in regards to his character or lack thereof. I do, however, see a depressingly familiar case of a talented, unusual person being singled out by the in-crowd and turned into a victim and a scapegoat. 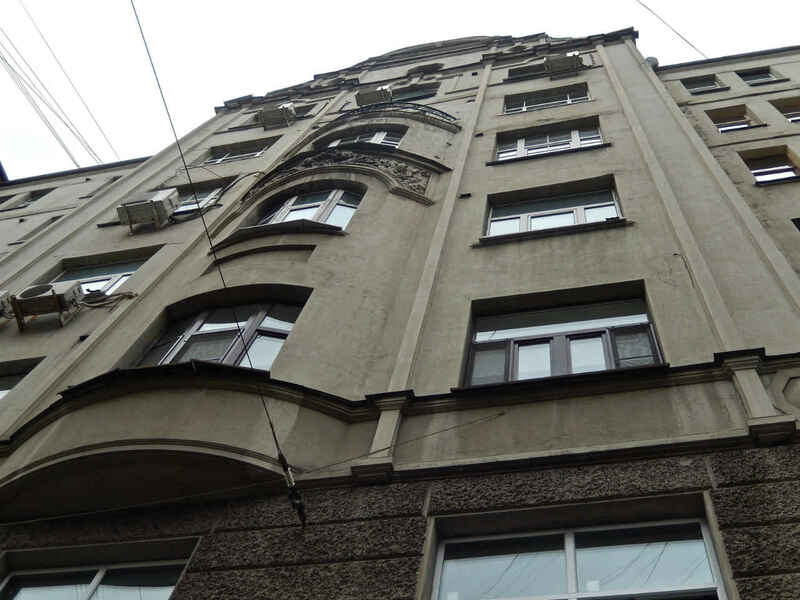 The story of Pavel Vasilyev may be messy and paradoxical. But it ends with a gunshot – probably to his head – which gives him certain rights in retrospect. Though fragrant as wild honey. As gray enshrouds our curls. Nikita Khrushchev (in Russian pronounced Khru-shchOF with the long ‘o’ sound, for those who don’t know) is one of those deeply controversial characters of Russian history. He led a de-Stalinization campaign after wresting power behind the scenes in the first years following Stalin’s death. The Stalinists were never happy about that and they had their revenge when power was wrested back from Khrushchev’s hands in 1964. 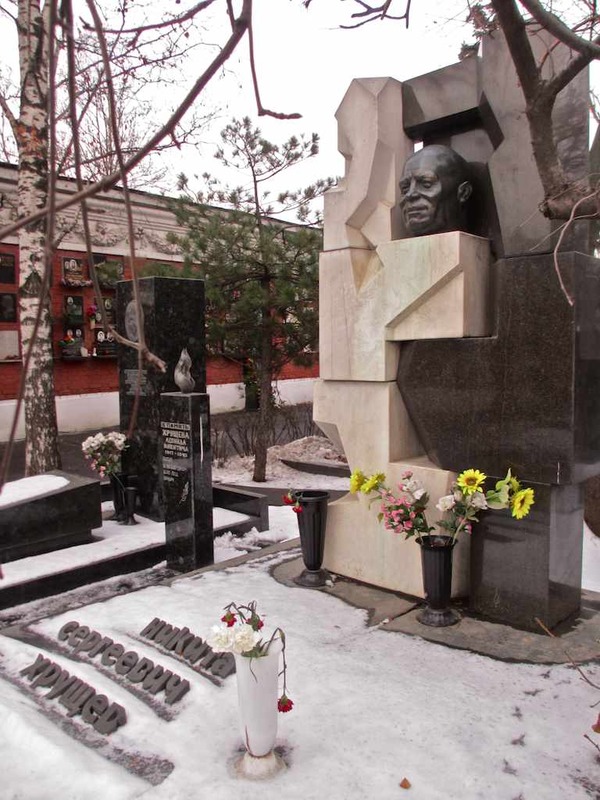 While Khrushchev acted in a Stalinist manner with his rivals in the mid-50s – having his main rival Lavrenty Beria shot in a basement – those who deposed him a decade later behaved in a Khrushchevian manner: They put him out to pasture in his beautiful dacha in the woods outside of Moscow and left him alone, even letting him write his memoirs (although they could be published only when smuggled to the West). I have an incredibly tenuous, but deeply memorable, real connection to Khrushchev. I was working as a freelance consultant and translator for ABC News in 1990, and we went out to the famed dacha to interview Khrushchev’s son Sergei about the changes then happening in Russia. I wasn’t much needed on that little trip, because Sergei spoke very good English. In fact, within a year he emigrated to the United States where he took up teaching positions in various East Coast universities. However, before the TV crew got down to the business of filming and interviewing Sergei, there were a few moments of chit chat. 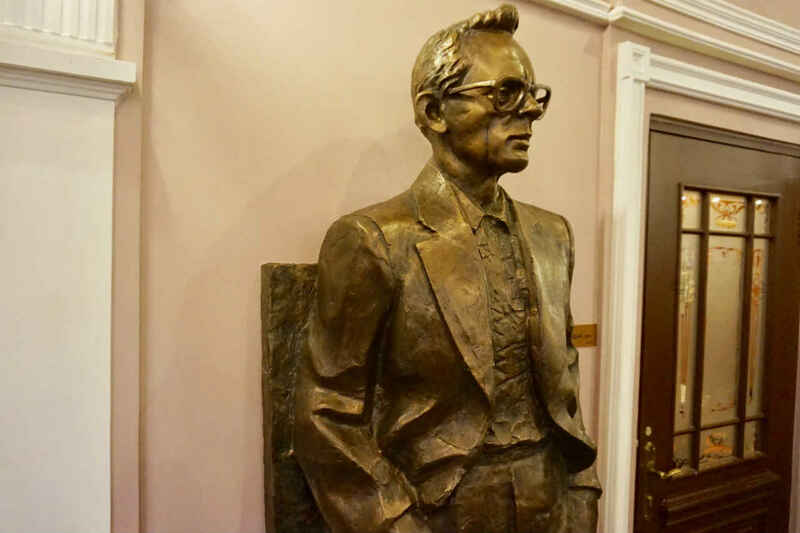 I exchanged a few words with Sergei and the conversation went quickly to the beauty of an artifact that stood, or hung, right in the entryway. This was a gorgeous old burka, a traditional Georgian coat that had been given as a gift to Nikita on some state occasion. The family kept it, surely because of its beauty, for all those years afterwards. And then Sergei said to me, “Why don’t you put it on?” And he went to pull if off the stand on which it hung. He put it over my shoulders, a photographer snapped a photo or two (which I have never seen), everyone laughed and declared it a beautiful fit, and then Sergei removed it from my shoulders and put it back on the rack. From there everybody got down to work. Khrushchev had a huge impact on Russian culture. It wasn’t always good. One of his most famous moves was to shut down an exhibit of nonconformist art in 1962. As he walked through the exhibit he grew increasingly angry and shouted obscenities at the artists, threatening to deport them. Not one of his better days. But Khrushchev also unleashed The Thaw, that short-lived, but powerful era in Soviet history which gave rise to a completely new attitude, style and content in Russian culture. The nonconformist art that Khrushchev so hated was made possible by his radical change in government policy. In just a few short years, Soviet theater, literature, painting, film and every other form of art were transformed. The spirit of youth flooded into a cultural territory that had been dominated by the old and the gray. Folks in the West know Khrushchev as a bit of a caricature for the threat he made to “bury the West” and for the – very possibly apocryphal – incident when he “banged” his shoe on a table at the U.N. Wikipedia gives you some info on that. But Khrushchev was not a caricature. He was a man of flesh and blood and conscience. I will not dig too deeply into the complicated catacombs of the latter, for historians have broken more pens, typewriters and computers on that one than I have time to deal with at the present moment. But it is a fact that Khrushchev was a figure who fully encompassed the dark and the light of his age. 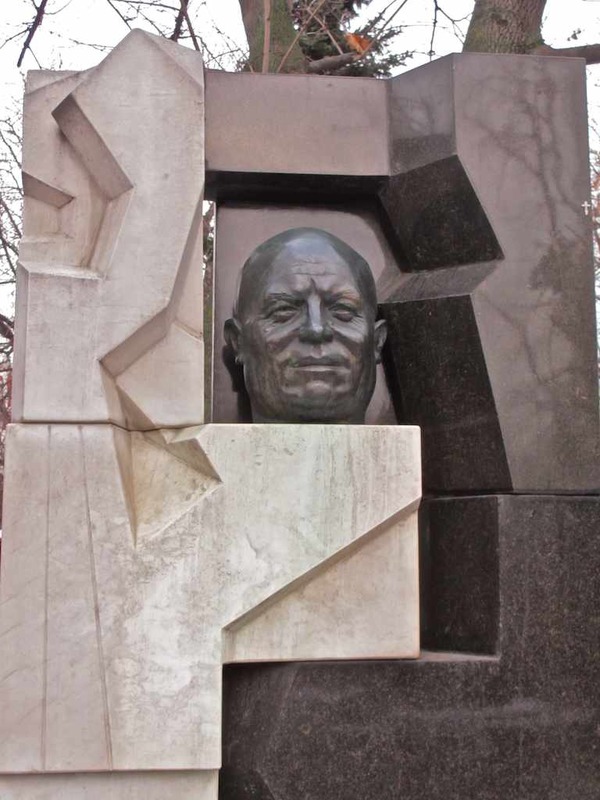 That is precisely why the great sculptor Ernst Neizvestny, when creating the monument for Khrushchev’s grave, enclosed a very sympathetic image of the leader’s head in a twisted, unsymmetrical jungle, if you will, of black and white blocks. 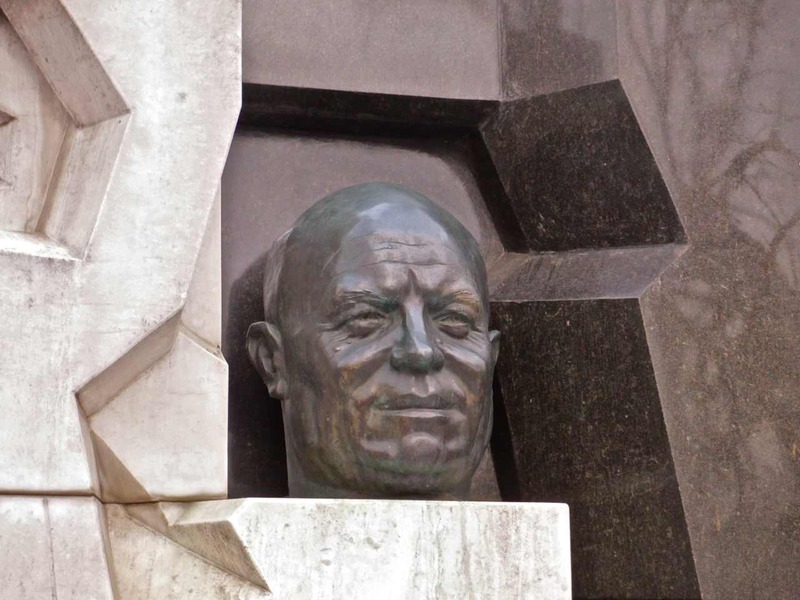 Neizvestny, by the way, was one of those artists whose work Khrushchev lambasted in 1960. 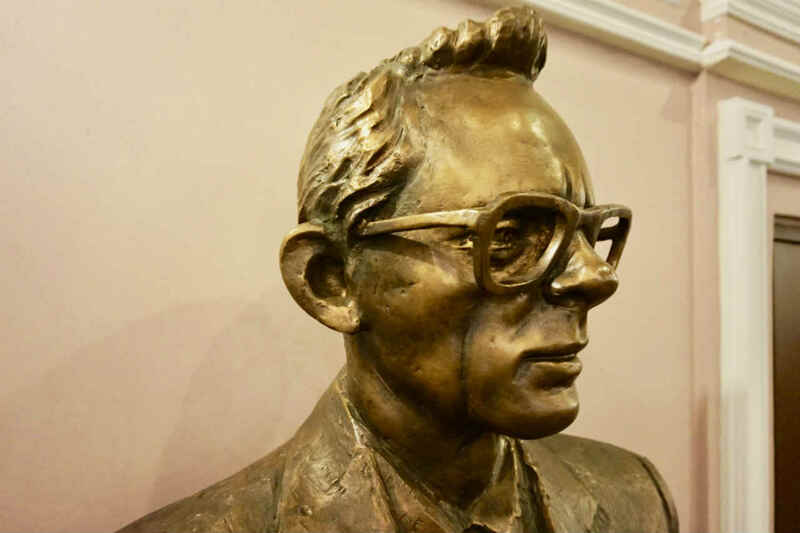 He called his sculptures degenerate and accused him of distorting the faces of the Soviet people. 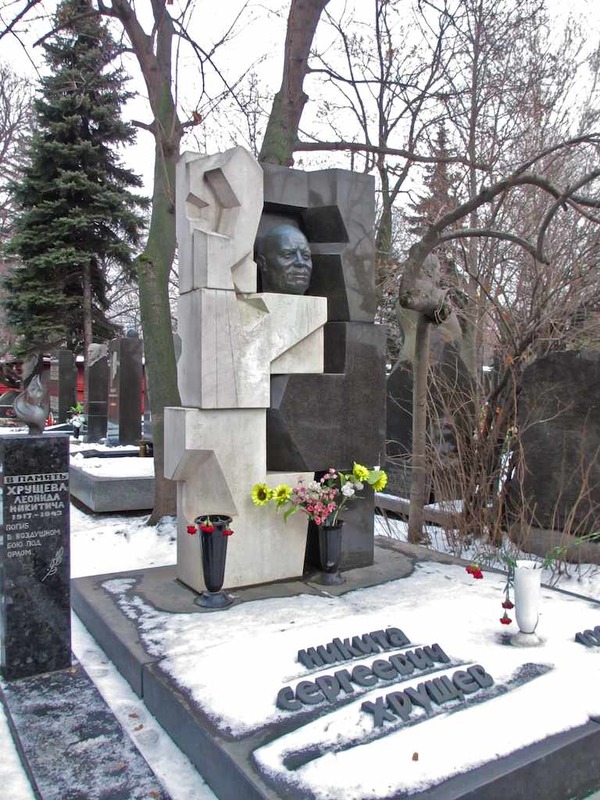 One applauds the Khrushchev family for asking Neizvestny to create the sculpture for the grave site, and one sees Neizvestny’s grace in the beautiful, human, realistic (not “distorted”) rendition of Khrushchev in a moment of peace and repose. So much has been written about this that it can easily slip into cliche. But when you stand before the monument, as I did yesterday, one sees nothing but the beauty and the quiet power of the work. 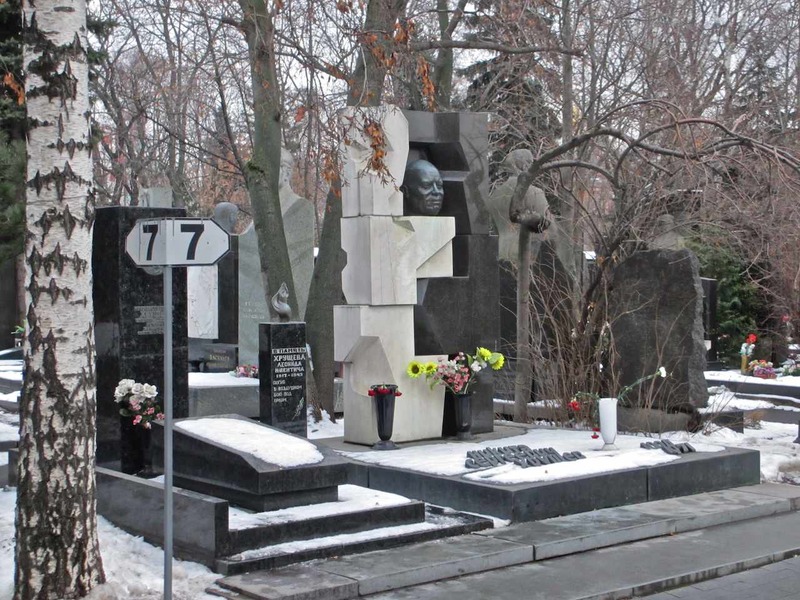 I happened to pass by Khrushchev’s monument at the Novodevichy Cemetery yesterday because I was attending the funeral of the great Soviet-Russian filmmaker Eldar Ryazanov, a man I admired deeply and who was a cherished family friend. 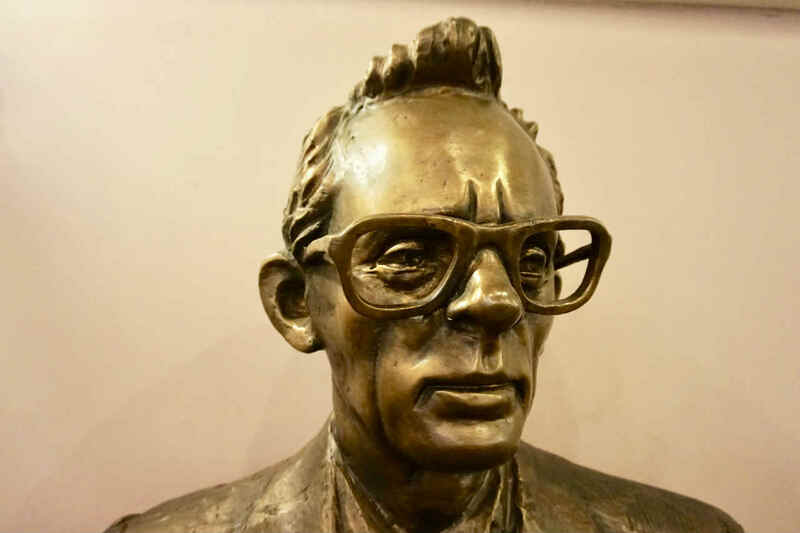 Arguably, no single artist defined the Soviet experience from the period of the The Thaw until the present day better than Ryazanov (1927-2015). It is received wisdom that his best films were made between 1956 and the late 1970s, and that his work was of less interest from the 1980s on. People are going to argue that until they are blue in the face. That statement will remain with us, and it will remain without a definitive answer. As such, I have no interest getting into that. I mention it because it’s there, but the magnitude, the impact, the contribution made by Ryazanov to his nation from his first film in the the 1950s until his last in 2007 is, frankly, incalculable. I don’t think Russians of the last 50-60 years loved anyone with the love and respect that they had for Ryazanov. When with him, I saw crowds of people – whether on foot or in cars – come to a dead stop when they saw him coming. I once felt as though I were following Moses through the Red Sea as Ryazanov stopped heavy traffic on a four-lane road merely by stepping into the flow of cars. He didn’t bother to look first, he didn’t bother to hold up his hand. He just stepped off the curb and went, and cars on all sides respectfully came to a stop to let him – and us with him – pass. If you know Russian traffic, you know this simply does not happen. Russian drivers do not stop for anyone. They did for Ryazanov. I will have plenty of opportunities to write more about Eldar Ryazanov. I will seek them out. But today, the day after we laid him to rest, I want to keep it simple. I want to share a few words that others have spoken in his regard. The phrase I have heard most often is, “the end of an era.” Every one who said that felt compelled to admit that this is a clichéd phrase, but that, in regards to Ryazanov, it is quite simply the truth. The actress Tatyana Dogileva echoed many when she said at the public farewell that Ryazanov had educated and fine-tuned the conscience of several generations of Russians. Also speaking at the public farewell, Lia Akhedzhakova, one of Ryazanov’s favorite actresses, told how Ryazanov freed her to speak the truth openly and forcefully. “He taught me to open my mouth and to tell the truth,” she said. As for me, I was incapable of looking at Ryazanov without seeing a whole nation. He was that big. His aura was that full and strong. This has nothing to do with his famous love for food. (He loved his food and, more importantly, he loved his appetite. He recognized it as an expression of his prodigious love for life and anything that sustained it.) 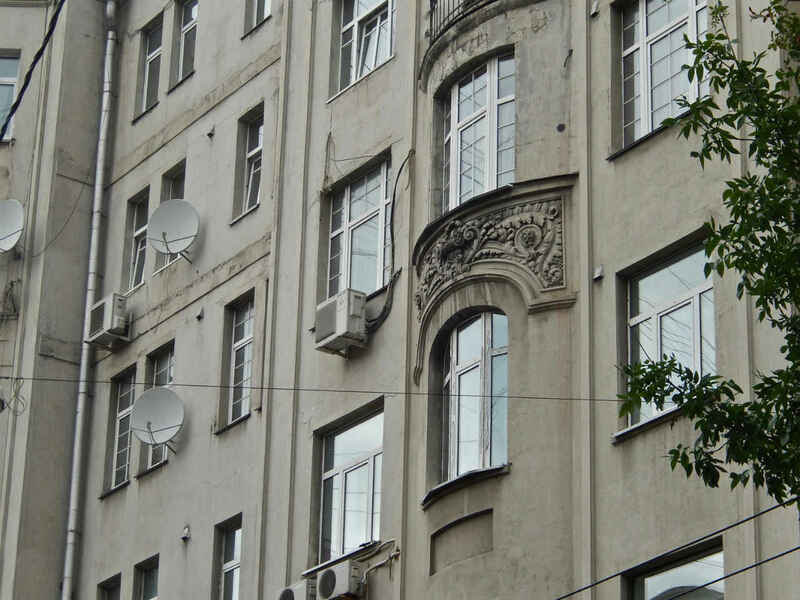 It has everything to do with the magnitude of the phenomenon that was Eldar Ryazanov. He was as simple and as down-to-earth as anyone you can possibly imagine. He was approachable, he was generous and kind. And yet he had a full knowledge of his importance, and of the responsibility he carried as a man in whom an entire nation saw itself reflected. Ryazanov’s first feature film, the classic Carnival Night, came into being, in large part, because of Nikita Khrushchev. Ryazanov told the story about how he, a fairly successful documentary filmmaker (he made seven documentary films between 1950 and 1955), became a maker of feature films. 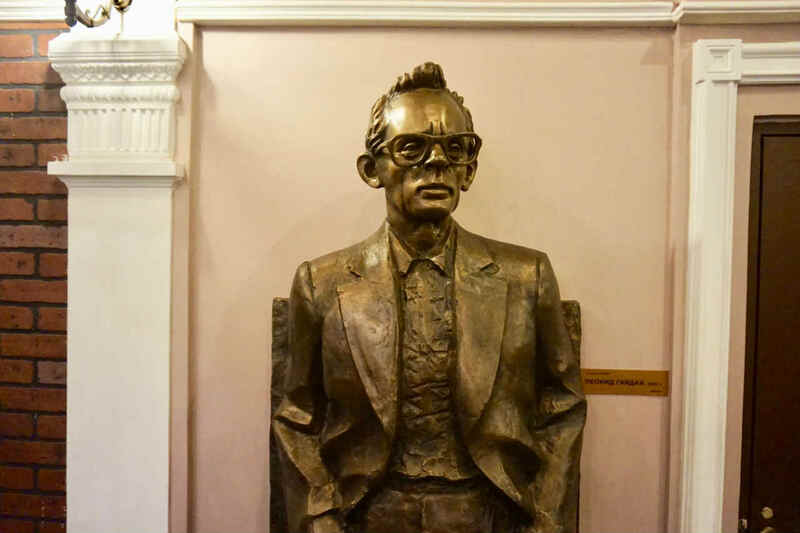 One day in 1955 he was called into the office of Ivan Pyryev, a legendary Soviet film director who was appointed the head of Mosfilm Studios in 1954. Pyryev told Ryazanov that if he didn’t produce a good comedy in short order, he would be fired. The word had come down from on high: We want a comedy. But there was no one in the stable of Soviet directors capable of making one. There was, however, this documentary director Ryazanov, whose sense of humor and purpose was already legendary. It was Pyryev’s belief and his hunch that Ryazanov might be the answer to the problem. Indeed, Carnival Night was a monstrous hit, easily becoming the most popular film of the year. As it tells the story of a New Year celebration with wit, intelligence and affection – as well as with some pointedly barbed political statements – it has continued to be shown with regularity every New Year right down to our own time. 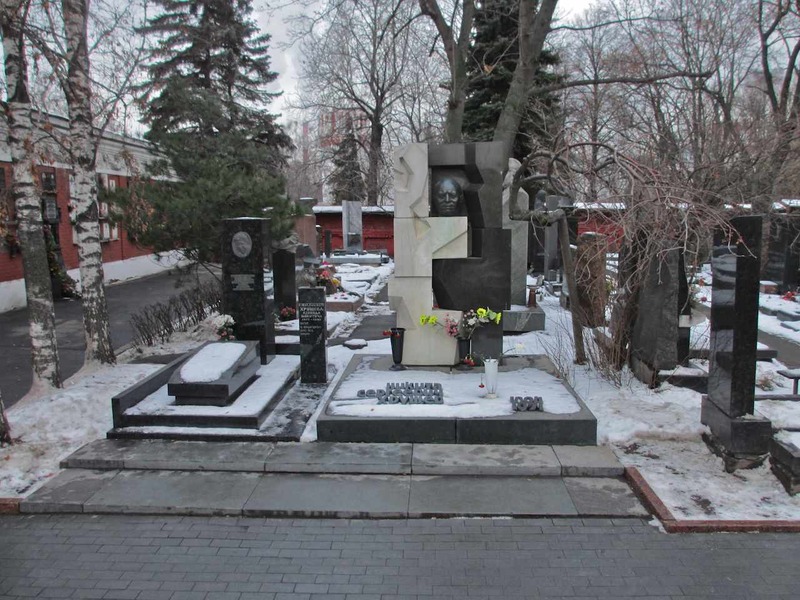 Ryazanov now rests about 50 yards away from Khrushchev. Look at the middle photo in the block above. You’ll see a red wall in the back. Ryazanov’s plot of earth is located just beyond that, a little to the right. As the Russians say: May the earth be down to him.